With a gathering of friends on a cold Christmas eve in Colorado, the fireplace crackling, the snow gently falling, the lights on the Christmas tree twinkling, this collection of intertwined Classical and Christmas music was born. I wanted to create and play something unique and special for my audience and the idea of combining a Classical piece along with a Christmas song seemed like the perfect gift for them. I revisited some of my favorite Classical pieces, and introduced each of them to a Christmas song to see where this courtship would lead them. Each Classical and Christmas song weaves in and out of the other, as if walking hand in hand leaving two sets of footprints in the snow. 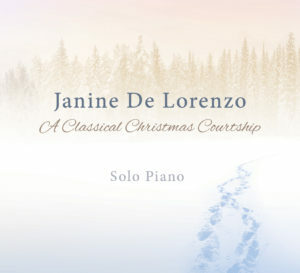 Enjoy the Courtship of Classical and Christmas!